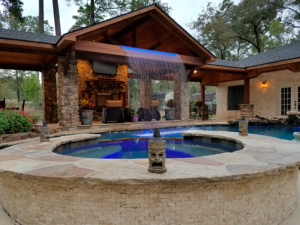 This magnificent Kingwood landscaping project emphasizes a Texas rustic hill country theme with modern touches that features a stunning LED lit rain curtain waterfall flowing out of the cedar rafters into a lagoon style pool. 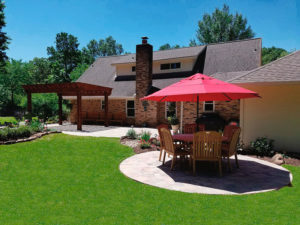 The elegant flooring consists of hand placed Oklahoma Wister flagstone, and the structure is constructed of natural stone and travertine stone veneers. 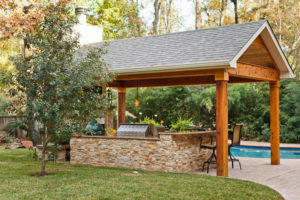 In unison, a constructed cedar tongue & groove ceiling with recessed lighting finishes off the main outdoor structure. Entertaining from this spacious outdoor space happens with built in TVs and extended dining areas. The kitchen is a pleasure especially with a full array of professional Vintage brand appliances that are built in, plus BBQ with the ultimate Big Green Egg grill and smoker. Leather finished granite counter tops with chiseled edge provide a durable surface that is easy to clean and requires no extra maintenance. More impressive, everything possible is remote controlled! In the winter months, keeping warm is possible with a wood burning fireplace; a cedar mantle decor complements the fireplace. To stay cool in the summer, Energy Star Haiku fans were installed. Haiku fans have won more than 75 international design and technology awards, including the prestigious red dot Award. Drought tolerant landscaping surrounds the main structure. Behind the structure, a dry creek bed, natural gas fire pit, fish pond with waterfall, flagstone pathways, and Kichler accent LED landscape lighting add beauty. Don’t hesitate to Contact Warren’s Today. 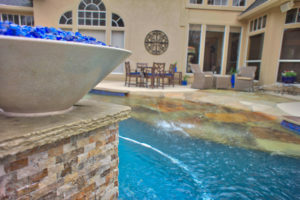 We can build your dream outdoor space!